Rachel Zamir grew up in a Lubavitch family in Stalinist Leningrad. Far from an easy combination. Jews caught observing their religion could be exiled to labor camps in Siberia, or far, far worse. But young Rachel’s parents were determined to raise their three children as Jews, despite the risks. The highlight of Rachel’s childhood was Friday night, when her mother transported the family to the place of their dreams, the impossible destination beyond the iron curtain. “Every Friday night, after the meal, the Land of Israel was transformed from a dream to reality in the living room of our humble home. “Mama would pack herself and each one of us a bundle for the journey, and would place several chairs around the room, and the game began. At first, we sat. And mama announced: “Now we are getting on the train from Leningrad to Odessa!” Afterwards, we moved from the chairs to the sofa, in other words, from the train to a ship, which set off from Odessa on the Black Sea to the Jaffa port in the Land of Israel. Rachel Zamir’s parents didn’t survive the Nazi siege of Leningrad, but she and her siblings did, and merited to arrive and live for the rest of her life in the Land of their dreams. Today, the 29th of Cheshvan, Ethiopian Jews celebrate the Sigd, the holiday marking their yearning for Jerusalem. Last night, after he attended the annual Sigd festivities run by Nishmat’s Ethiopian students and attended by the entire student body and faculty, I met my husband at a popular restaurant for our weekly date. The company and food were awesome, as usual. But when we finished our meal and I began reciting the “Birkat HaMazon,” I paused in the middle of “Uvne Yerushalayim…” Rebuild Yerushalayim, the Holy City. Like Rachel Zamir in her living room in Soviet Leningrad. Like the Jews of Ethiopia in Addis Ababa and Gondar. I felt a deep yearning for Yerushalayim Ihr Hakodesh. The only difference between me and them is that they were yearning to be there. And I am yearning to be here. 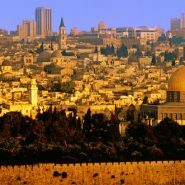 Yearning to be in Jerusalem, when I’m in Jerusalem. Yearning to be with my children, when I’m with my children. Yearning to be with my husband, when I’m with my husband. Yearning to be with Hashem, when Hashem, as always, is right here by my side. Wow beautiful. Thank you. My parents are from Odessa and the first time we visited Israel, my father cried while he benched the first Bircas hamazon in Israel. So true! Beautifully written, and a treat to read. Thank you for sharing. Jerusalem- even when you live in it, you still long for it. עיר שגם כשאתה גר בה אתה מתגעגע אליה. As usual – an amazing article! thanks for sharing your feelings and expressing our hopes and dreams! That yearning that you feel is the soul yearning for completeness with Hashem. Some people feel this especially on Shabbos, the day that we are “married” to Hashem (as found in chassidus). When I wonder, what does it mean to love Hashem, I know that the yearning is a form of loving Him.